This foundation section was leaking through honeycombing, and as the interior was fully finished, it was best to dig it out and install an exterior waterproofing system. When you have waterproofing issues with your foundation, it can be challenging to find the right solution. At Island Basement Systems, we typically recommend interior drainage systems for leaky basements and crawl spaces, but there are times when an exterior waterproofing repair is the right choice. If you've noticed leaks, standing water, or other waterproofing issues, call us today at 1-855-206-4811 or contact us online to get an evaluation of your basement or crawl space. Our experts will recommend the best solution for your needs. We offer free estimates on all our work in Victoria, Nanaimo, Saanich and the surrounding areas. When will exterior waterproofing not be the right choice? After the basement was dug out, we prepped the concrete by grinding it (to ensure it was clean), then installed the WatchDog Waterproofing and Delta-Drain system to provide a water-tight wall. Grinding of the concrete wall to ensure proper bonding of the waterproofing materials to the foundation wall. Installation of the WatchDog waterproofing, which is a Built-Green certified product that is spray applied to the foundation wall, providing a seamless blanket around the foundation. WatchDog also comes with a ten year warranty! Drainage membranes and geo-textile membranes to separate the soil from the drainage system. Typical PVC two-pipe drainage system, which we can also arrange for Building Permits and inspections as needed. We offer a ten year warranty, which is fully transferable, and is the best warranty on the Island! 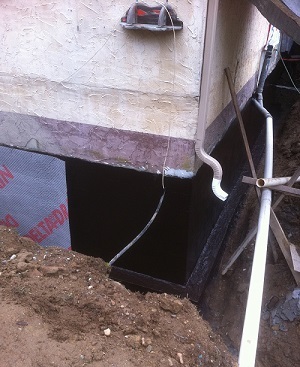 As part of our exterior waterproofing system, we provide complete excavation services around your foundation. It's important to have professional excavation to protect your landscaping, septic system, and foundation before your waterproofing system is installed. Our experts will evaluate your home and provide minimally invasive excavation based on the services you need. We can provide excavtion for basement waterproofing, foundation repair, and any other services your home may require. We always take care to protect your home and maintain your yard's appearance as much as possible. If you're having issues with water in your basement or crawl space, exterior waterproofing from Island Basement Systems could be the solution you need. We can provide you with a thorough evaluation of your home and a quality installation of our waterproofing system. Contact us today to get started with a free estimate in Victoria, Nanaimo, Saanich, Duncan, Campbell River, Langford, Courtenay, Port Alberni, Squamish, Esquimalt and throughout the surrounding areas.